"[W]here does it all come from, Andrés? The images, the words?" Posed early on, the question unleashes a mestizaje-of-a-tome--that is: a book that marries word and image, prose and poem: a hybrid work of art as personal and vulnerable and moving as anything I've read in a long while. This is risky writing, maybe even counter-intuitive if one is pre-occupied with forging a certain kind of "career." I couldn't stop reading, continuing to the end in one sitting. Maceo Montoya, the artist-writer, opens multiple fronts: dialogues with the living (father, art critic, lover); dialogues with the dead (beloved brother); indelible images from my native California--too often overlooked. But the exquisite prose poem narratives--unapologetic romanticismo in my view--are what completely won me over." 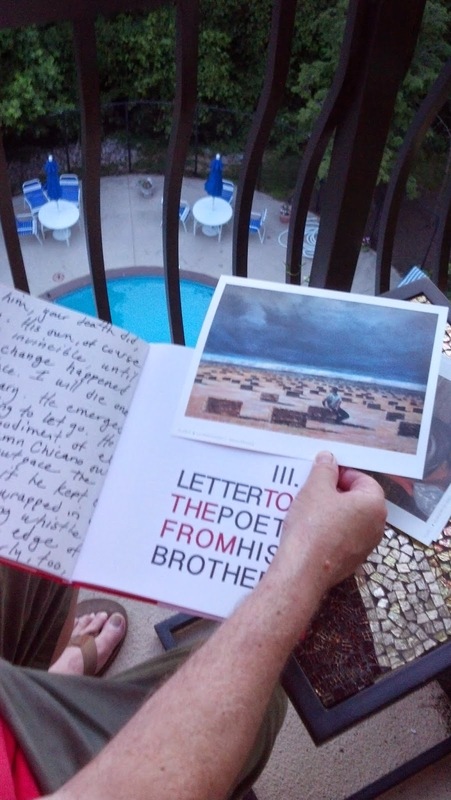 That was/is my two cents for LETTERS TO THE POET FROM HIS BROTHER, Maceo Montoya's new book, published by California-based Copilot Press. But what came next was an act of generosity which, given the subject-matter of the book, did not surprise me. 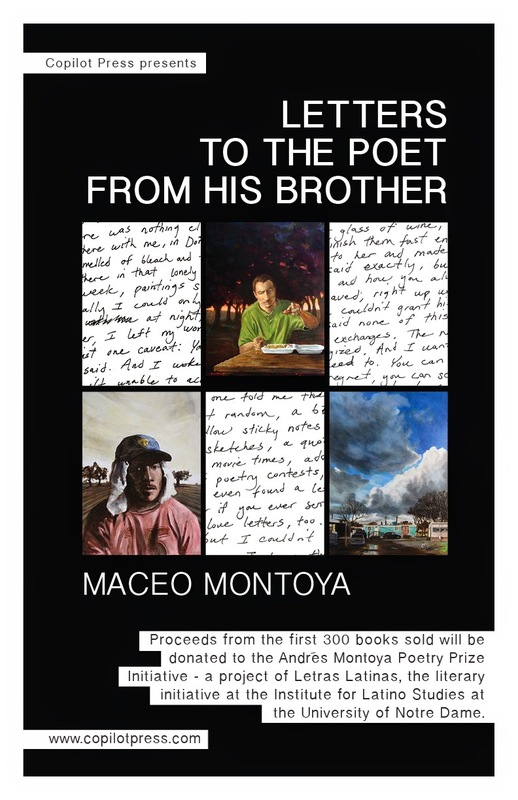 Maceo agreed to donate his share of the proceeds from the sale of the first 300 books to the Andrés Montoya Poetry Prize Initiative. Specifically, the proceeds are being earmarked for the one-day symposium Letras Latinas intends to carry out upon the publication of Andrés Montoya's posthumous collection of poems, edited by Daniel Chacón, and slated for publication with Bilingual Press. Up until now, the money we've been raising for the Andrés Montoya Poetry Prize Initiative has been coming from sale of Malaquias Montoya's "Untitled," a silkscreen print inspired by Andrés' poetry. Those who have been able to afford its price tag have generously contributed. 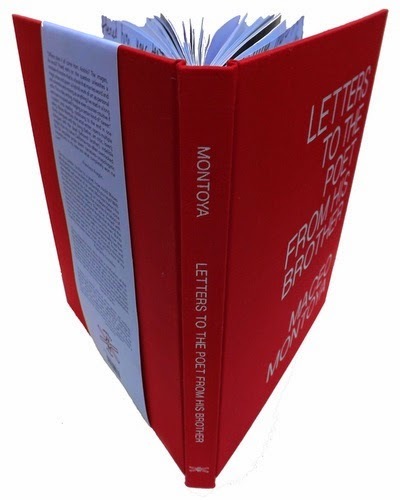 But Maceo's generous gesture is going to allow people to join the Andrés Montoya Poetry Prize Initiative for what we think is a very reasonable amount: $25, and that gets you this gorgeous book. So, please head on over to Copilot Press, order LETTERS TO THE POET FROM HIS BROTHER, and when it finds its way into your hands, follow these instructions, and join us. Gracias!